I love scrubs. I mean who doesn't? This is going to be a special mentioned post for one of my bestie - Illy! She's been an amazing friend to both Ayna and I, and when she actually breaks the news and telling us about launching her very own beauty product, we were both so happy and thrilled for her! Seeing the title and image above, you guessed it right, it's the handmade raw organic scrub that loaded with tons of great benefits to the skin. Princess Malaysia is committed (and excited) to supply Raw Organic Handmade Scrub. Our mission is to make as many princess at heart around the world to be happy and beautiful. All of our products are handmade with lots of care and love. Currently, there're two variation of scrubs that available on Princess Malaysia. 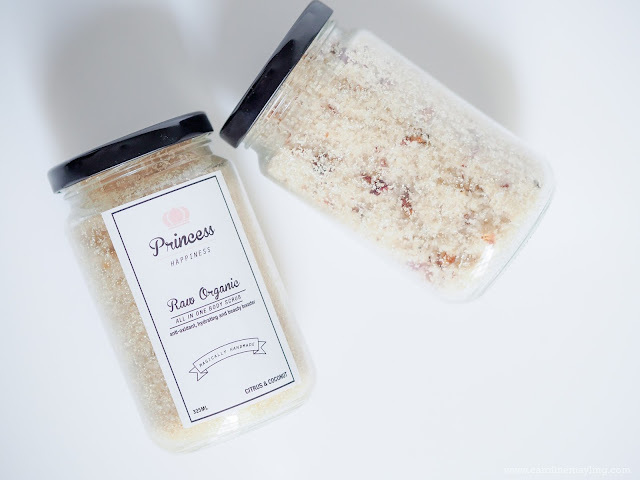 Princess Happiness is made of a mixture of orange essential oil, fresh orange, fresh lemon, extra virgin coconut oil, brown and white sugar. Followed by the Princess Glorious that made of a mixture of rose petals, virgin coconut oil and olive oil. I've been using both of them for the past few weeks and I really love how it leave my skin soft and polished and removed all the dead skin from my skin. They smells lovely too! Since she only uses natural organic ingredients for the scrubs, it is definitely safe to be use on the skin. p.s: We were really shocked when she told us that her scrubs are priced at RM35 each (include shipping within Malaysia) for 325ml! Thank you so much for being a great friend Caro :) wishing you lots of happiness and love~!